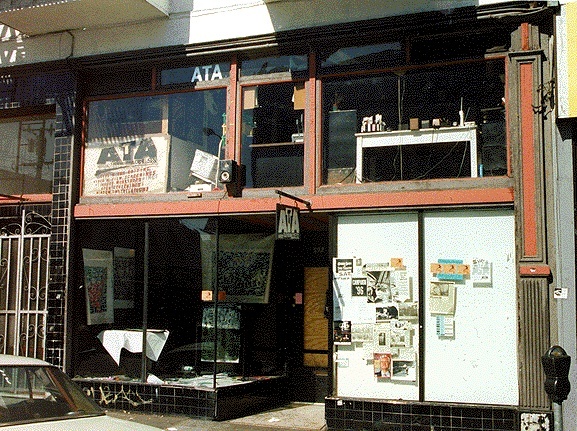 A wide-ranging conversation in February 2015 with ATA original, experimental filmmaker, and Other Cinema curator Craig Baldwin, on the Mission District's decades-long gentrification and much more. High tone and patronized by an affluent clientele, Esperanto and Val 21 can't help but be seen as gentrification, exhibits A and B. But "gentrification" is a loaded term, one that packs an implicit charge of classist/racist action, and as such it's worth being more specific about the term and the sentiment behind it. Since the 1948 Urban Renewal Act, Americans have, with rare exception, made a bad thing worse when it comes to urban planning. Instead of working with what was already present, urban planners and legislators repeatedly fell for utopian schemes that called for a "clean slate," clearing run-down neighborhoods--the socially vital buildings right along with the decrepit ones--and replacing them with high-rise slabs that proved, within a year or two, to increase the very ills they were meant to heal. (Locally, the experience of the Fillmore reflects how this policy wreaked havoc on a neighborhood). Though the era of high-rise slabs seems finally behind us, gentrification can be seen as an extension of the Urban Renewal bulldozer. Certainly the term carries with it the distrust urban renewal engendered. As an area becomes more attractive to the wealthy, property values and rents, (driven by rapacious realtors and apartment managers), have been known to select against the poor and/or small businesses who can't compete with the assets of a large corporation to secure and maintain a lease. On the street, this manifests in businesses less concerned with its neighbors and more interested in who it can attract from outside the neighborhood. "Of course you have those who give less and take more from a community," says Nidal Nazaal. Nazaal is the man behind what some call the "Nidal empire." Nazaal began with Cafe Nidal, on Mission Street, in 1983, which he has since sold to his sister. Then, in 1990, he opened Valencia Whole Foods and in February of 1991, he launched Val 21, a posh restaurant that always has a vegetarian entree on the menu. Three years later, in 1994, he opened the Burger Joint, and now his cousin, Adham Nasser, an attorney and realtor, has sunk more money into refurbishing a laundromat next door to Val 21 than it cost him to buy the property. "My philosophy was to provide something that every element of the population needs--healthy food," Nazaal says. "The decision for me has always been quality. The problem comes when someone cares only about money." If that were the case, he says, "I could have opened a liquor store, or, instead of good meat [for the Burger Joint], I could charge the same for cheap meat. But I wanted a places where my family would want to go." Nazaal agrees that Valencia is experiencing gentrification, but only to a point. "It will require the right balance, the right businesses, the right landlords. There are always some who will take the route where they don't care about people ... But look at this way, before we set up here, there were 30 people who were not employed by me. And almost all of them live in the neighborhood." As does Nazaal, with his wife Saandra and their infant daughter. "11 years ago we were one of the first ones here," says Servio T. Gomez, the proprietor at Back to the Picture, a custom frame shop and gallery that features Latin American artists. "It was filthy, with lot of places empty, lots of vacancies." Gomez acknowledges that the higher prices of some restaurants may push some people away, but believes the changes are helping his business and others owned and operated by Latinos and Latinas. In a one block radius from his store, for example, there are at least six businesses run by Latin or South Americans, including Valencia Auto Parts, the Mail Carrier, La Casa Del Libros (Books on Wings), Yahoo Herb 'n Ecology, and La Rondalla Mexican Restaurant. Says Don Alan, who owns Radio Valencia with his wife Lydia, "I don't think it's really the case that the change is coming at the expense of the people who live here. In many ways, Valencia was a retail district that had died out. When I first came to the Mission fourteen years ago, these places were all boarded up. A lot of previously unused space is being brought back to life." At the idea that Valencia bistros could be seen as catering to outsiders, Alan shook his head. "There's a cafe like Radio Valencia in every neighborhood in San Francisco. Ours is a neighborhood business. If we didn't serve our neighbors, we wouldn't be in business." Kate Rosenberger, who says she choose the location for her used bookstore, Dog Eared Books, in large measure because of Radio Valencia, characterizes the change as "pretty damn organic." One of more than a dozen women who own businesses on Valencia, (others include Bernie's Pet Store, the aforementioned La Casa Del Libros, Vertical Clearance, a haircutting salon, Modern Times Bookstore, Good Vibes, etc. ), Rosenberger misses Amelia's as much as the next woman, but says she's "totally encouraged" by the changes on the street. And, as to whether Valencia's gentrification is driving up commercial rents, it hasn't yet. Several new merchants--at Captain Jack's, a vintage clothing shop, Marie's Gourmet Foods & Coffees, and Sinopia, told me they choose Valencia primarily because they could afford it. In all, Valencia Street's make-over, though deserving of concern and activism to preserve opportunities for Mission residents, defies both the knee-jerk charge of gentrification and, for that matter, trend story journalism. For every talisman of the Western invasion of yuppies, (e.g. the price of a call bottle whiskey at the newly re-opened Bruno's is $4.25! ), there is another scrap of evidence it's not as bad as we thought, (e.g. the Hibernia bank building at 22nd and V, rumored to be a new Gap clothing store, will actually be a Social Security office). For every tempting pose to strike against the chi-chi restaurants, there's the tempting five and six dollar entree destined to make you a hypocrite. And for all of San Francisco's obsession with food, one could easily build an argument that it's Valencia's cultural activity -- the one-room art galleries, experimental theater venues, and churches -- that best defines the avenue. The future of Valencia, says Casenave, comes down to "making sure that the people who live there now have a similar opportunity as those who are moving in. But what we don't need are more planning meetings. What we basically need is to go to work on a plan. We need an affirmative program to ensure everyone gets a chance and a committee that steers the private sector so it functions in the community's best interest."